Bollywood actor Akshay Kumar is going to be seen again in the color of his patriotism. This time he will be seen fighting the battle of Saragarhi with a Sikh look. The movie 'Kesari' has recently launched the trailer. Akshay Kumar has also shared on his social media account. Actor Parineeti Chopra is in Akshay Kumar's upozit role in this film. This is a period drama movie. The film is directed by Anurag Singh. There is a tremendous action of Akshay in the trailer. On the social media, the trailer is getting tremendous response. People love the trailer. Fans also appreciated Akshay's acting. Fans are also quite pleased with the dialogues shown in the trailer. The movie trailer is of 3 minutes. Which starts with Akshay Kumar's finest dialogue. The tremendous action has been shown in the trailer. How the 21 Sikh warriors fought against 10 thousand Afghan warriors The background music of the trailer is tremendous. The film has a tag line, 'Today is my pagari too kesari Whatever is going to be, blood is also Kesari and my answer is Kesari. 'It is very much liked by the audience. 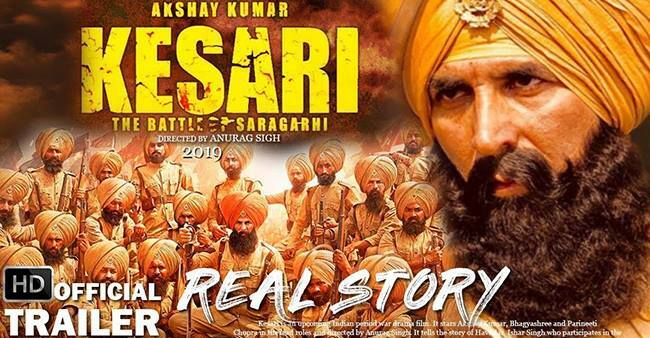 Akshay Kumar will appear in the role of Ihsar Singh in the film. On 12 September 1897, in the leadership of Havildar Ishar Singh, the Sikh Regiment fought for ten hours with the troops of the Afghan army in Saragarhi for several hours. The number of Afghan soldiers was very high but still he kept on the ground and did not give up till the end. Akshay Kumar is showing the zeal of his patriotism in the trailer. Their passion and passion are worth watching. Within a few minutes of the trailer release, it became very viral on the Internet. On Wednesday some of its new posters were released. Please tell that its teaser was released on Tuesday last week. Akshay's film 'Kesari' will be seen on 21 March 2019 i.e. on the occasion of Holi.